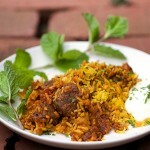 Indian Lamb Biryani is a casserole of tender lamb curry and fragrant saffron rice. Two outstanding dishes combined into one company worthy casserole. Serve with cooling cucumber raita on the side. I had a very biryani week. Biryani is an Indian curry and rice casserole that I’ve been hearing about, thinking about, maybe even dreaming about – for a long time. Finally, this past week, I immersed myself in it. It started when I was invited by a friend to take a cooking class at Whole Foods and I got to choose the dish we cooked. I picked biryani. We learned to make a very tasty, quick biryani with boneless chicken and precooked rice. After that I came home and pulled every international cookbook and Indian cookbook off my shelves… I scoured the internet….and the cooking began. My (poor? lucky?) family had Biryani for dinner three nights in a row – lamb, chicken, lamb. The lamb biryani was the unanimous winner. This is definitely not of the “quick and easy” genre of recipes, but it’s SO worth the effort! 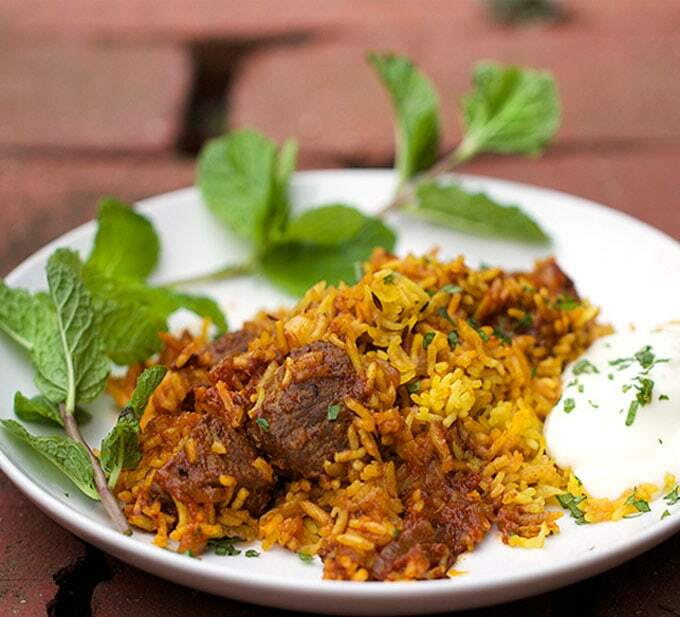 This lamb biryani recipe consists of two distinct dishes – succulent lamb curry and aromatic rice. Each component is delicious in its own right, and then the two are layered together in a casserole and baked. 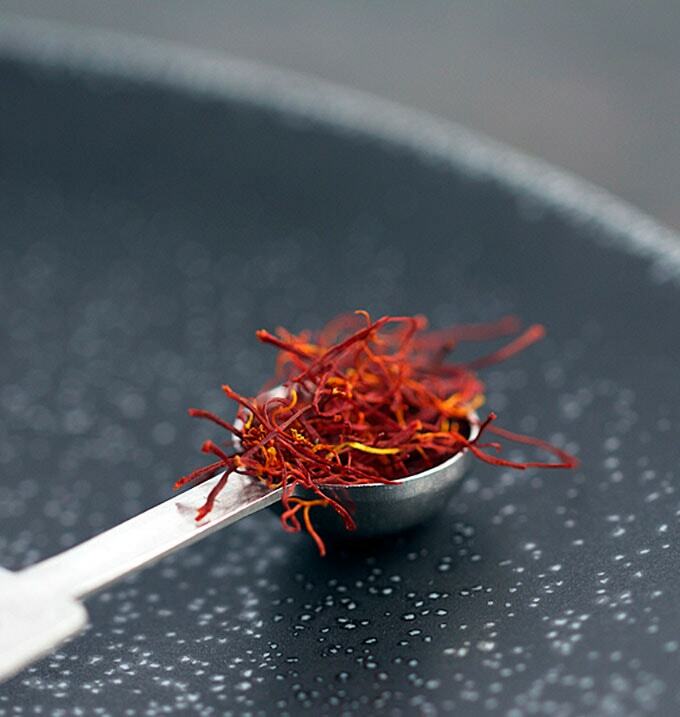 Saffron is one of the world’s most expensive spices but luckily it only takes a little bit to flavor the whole dish. 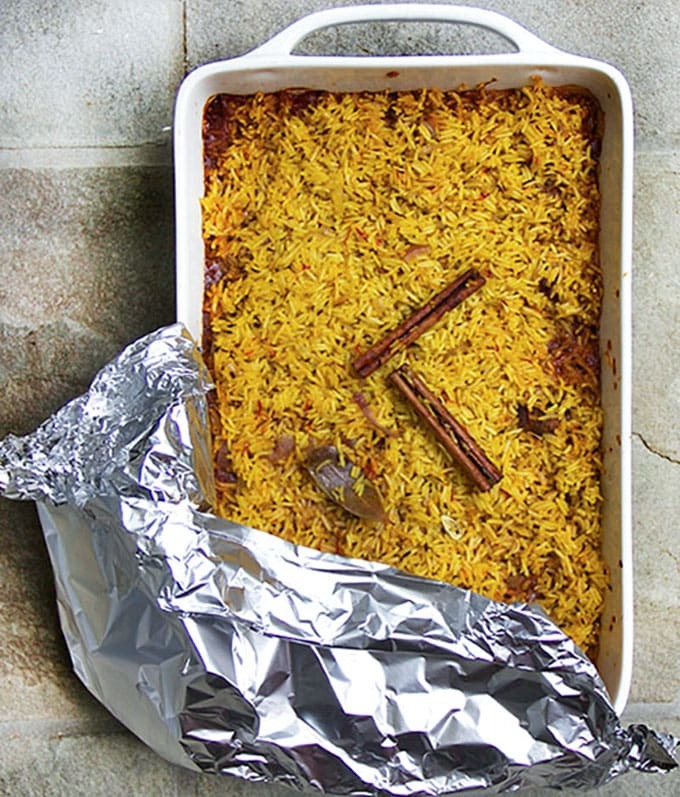 This Indian Lamb Biryani is packed with deep and exciting flavors and a good amount of heat. It’s definitely dinner-party worthy! I think it’s important to serve Indian Lamb Biryani with a cooling, creamy, cucumber-mint raita to complement the heat of the dish. Your palate will thank you! 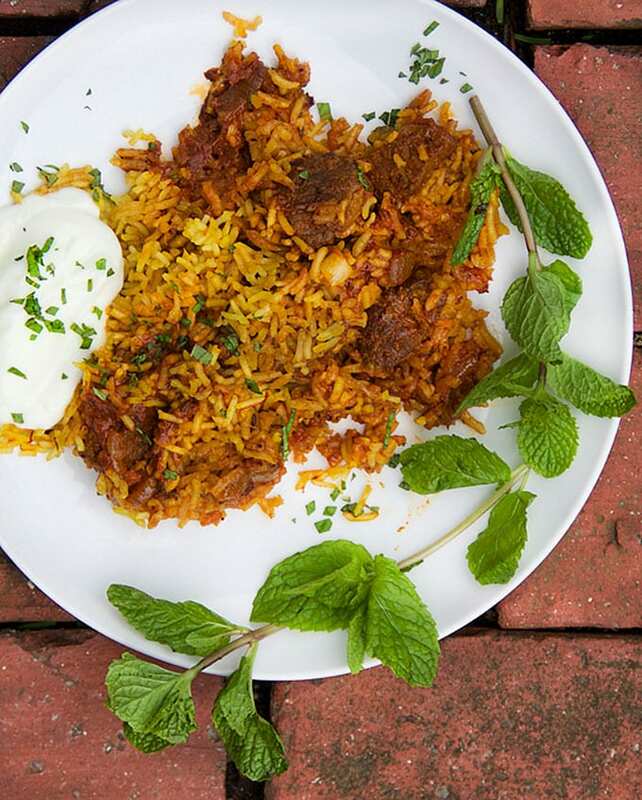 Here’s the recipe for Indian Lamb Biryani. If you try this recipe, I hope you’ll come back to leave a comment and let me know what you think. Sumptuous casserole of tender lamb curry with saffron spiced rice with cucumber-mint raita on the side. RINSE and SOAK the RICE: Put rice in a large bowl. Fill the bowl halfway with cold water. Swish rice around for a few seconds and pour off the cloudy water. Repeat 3 or 4 times, until the water is fairly clear. Cover rice with cold water by 2 inches and set it aside to soften for an hour. Drain. Mix the sauce ingredients together in a small bowl: tomato sauce, cayenne, paprika, salt, turmeric and garam masala. Set aside while you brown the lamb. BROWN THE LAMB: In the pot you used for the onions, heat 2 tablespoons of oil over medium high heat. Add half the lamb with its garlic-ginger coating, and cook for about 5 minutes, tossing occasionally, until the pieces are browned on all sides. Transfer to the plate with the onions. Brown the rest of the lamb, adding more oil, if necessary. Once the second batch of lamb is browned, return the other lamb and the onions back to the pot. Pour in the sauce. 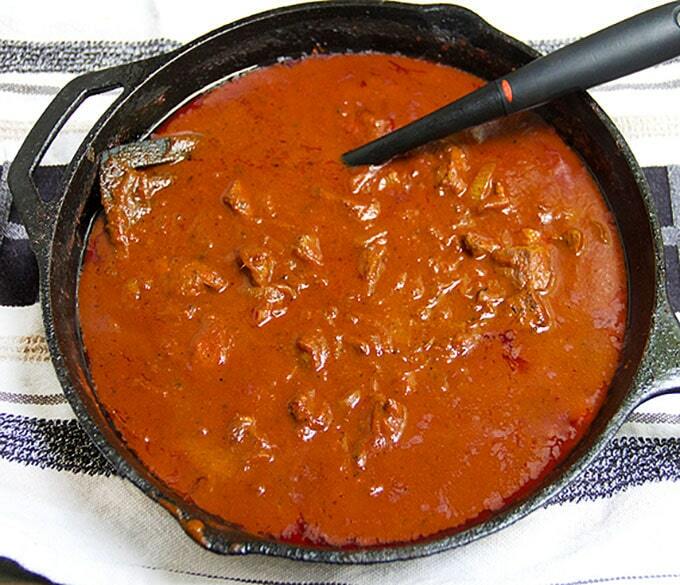 Stir, scraping the bottom of the pot with a wooden spoon to release the browned bits of lamb into the sauce. Bring to a simmer. Cover and cook for 25-30 minutes, until the lamb is nice and tender. Remove from the heat. PRECOOK THE RICE: While the lamb is simmering, heat 2 tablespoons of ghee or butter in a medium sized saucepan. 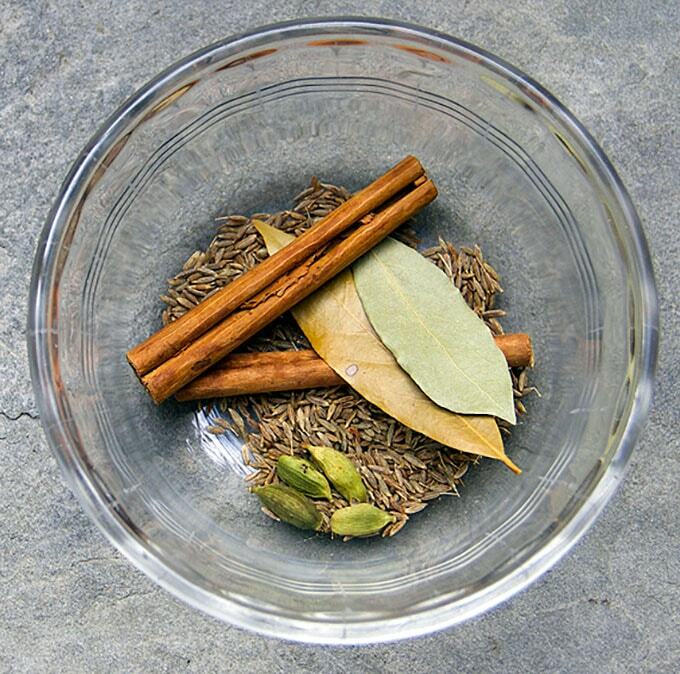 Add the spices: cumin seeds, cardamom pods, bay leaves, and cinnamon sticks. Cook until they sizzle a bit and you can smell the cumin toasting – about 30 seconds. Add the onion and cook, stirring frequently, for 3-4 minutes, until it starts to brown. Add the saffron and cook stirring, for about 30 seconds, until the saffron releases its color and aroma. Add the drained rice and toss to coat. Pour in 2 cups cold water and 2 teaspoons salt. Stir to combine. Bring to a boil. Lower to a simmer and cook for 5-6 minutes, uncovered – until all the water has evaporated. Remove from the heat. CUCUMBER RAITA: Combine all the ingredients. Cover and refrigerate until needed. *Note: The bay leaves, cinnamon sticks and cardamom pods are not meant to be eaten. Remove them or tell people to be on the lookout for them. This recipe looks absolutely amazing! I’m considering to make this for a dinner party, but I do have a question. Do you think I’ll be able to make the lamb and curry sauce a day before? And then on the day of the party just make the rice and put the lamb curry and rice together and pop it in the oven? Yes, you can absolutely make the lamb and curry sauce the day before! That’s a great idea. You’ll have most of the hard work behind you and on the day of your party you can just make the rice and layer everything into a casserole and pop it in the oven. Enjoy!! I hope you can help me out. I want to make your dish but I don’t have an oven. Is it possible to bake everything in a pan for 30 minutes instead of an oven? Is that a good solution? Please help me out! Hi Max. I’m sure there is a way. I would suggest that you layer the biryani into a heavy pot with a lid, preferably enameled cast iron like a Dutch oven. You want something that’s can heat up and keep a lot of heat in so the entire contents cook evenly and the bottom doesn’t burn. Cover the pot tightly and cook it on low heat for 40 minutes or so. Let me know how it turns out! Yes – not simple, but directions were spot on and very easy to follow – I liked how multiple things were done in parallel, but were not rushed. I used less saffron (my poor measuring) – so my rendition lost some of the gorgeous yellow that your photo has – but the flavor was ideal. I’m so happy to hear that you enjoyed the cooking part as well as the final dish Joel. I feel the same way about this recipe. It’s one of my family’s favorites and though it takes time to cook, I love the process too. 🙂 Thanks for this note – I appreciate it so much. Happy New Year! I have on problem, I can’t cook it in the oven…. Do you have a solution? Can I, instead of baking it in the oven, for exmaple bake it in a nice big pan? For 30 minutes? That’s my only possibility, I don’t have an oven…. I’m going to try this recipe. 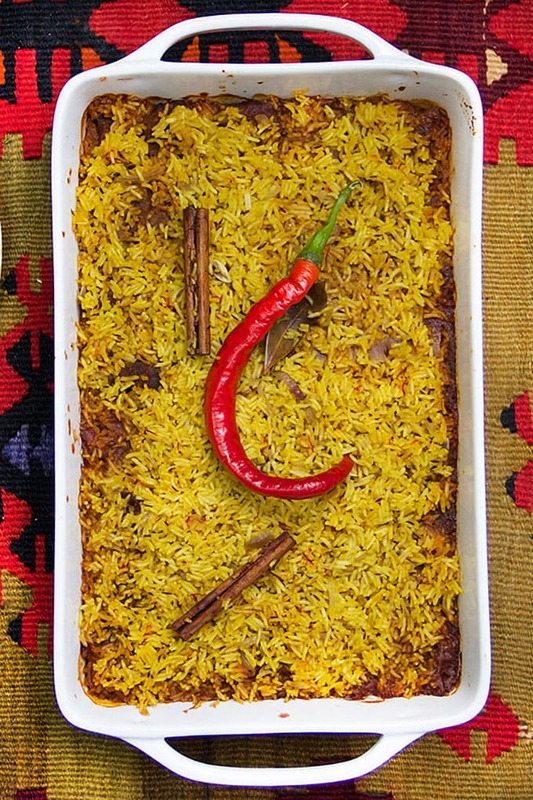 I just made Chicken Biryani but with a different technique (cooking the rise on a pot) and I want to try to do Lamb Biryani (my favorite Indian dish) since lamb it’s more expensive on my country I want to try it with chicken first (Do you have you chicken biryani recipe?). When I do it I’m going to post another message here with my review hehehe. I don’t have a chicken biryani recipe on Panning The Globe yet. Maybe some time soon. I hope you enjoy the lamb biryani. I look forward to hearing back from you! It’s in the oven right now and I can hardly wait. My house smells amazing. I really appreciate your step by step directions. Made this very fun to put together. I’ll let you know what it tastes like soon. Thanks for the recipe!! I’m so glad you enjoyed the cooking process. 🙂 I hope you love the biriyani as much as I do. Let me know! Tomato sauce is smooth sauce in a can. It doesn’t have any chopped tomatoes in it. It’s usually easy to find at grocery stores. I hope you enjoy the Biryani! This was fabulous. It took a while to prepare but the resulting dish was showstopping! Thank you! I made this tonight for our dinner and it was gorgeous!!! It took me about 2 hours to prepare (incl the washing up) but was a really enjoyable recipe to make. I didn’t put it straight into the oven as I’d prepared it early but covered it in the foil and then just put it in the oven when we were ready. This worked a treat so could easily be made for a party ahead of time. We all agreed it was fab. We don’t like our curries too hot so I only put 1/4 tsp of cayenne pepper in and it was perfect – enough kick that it tasted like curry. Thanks, I’ll definitely be making it again. Hi, is it is possible to make this with leftover roast leg of lamb? Or does the lamb need to be cooked raw after marinating? Thanks!! Hi Andrew, I looked back over the recipe to see if I could figure out how to suggest adapting it with cooked lamb. If your leg of lamb is really rare, you could still marinate it per the recipe, and brown it briefly and then proceed with the recipe as is. I think that would work well. If the lamb is cooked medium or well, don’t bother marinating it. Make the spice paste for the marinade and then where it says “BROWN THE LAMB,” – instead, brown the spice paste a bit, just to bring out some good flavor. Add your cut up leg of lamb, and the sauce and follow the directions from there. I hope that works! I think it will. Let me know. I tried this recipe I loved the flavours. It tasted just like briyani i remember from back home Durban, South Africa. I over cooked the rice thou 🙈. Overall my friends & I loved it will be making it again. Just made this today. Its so delicious! I made it with lamb shank, cooking it with pressure cooker in the curry sauce for about 1 hour (until the meat fall apart). Pulled the meat out, mix in sauce before putting in oven with the rest of the ingredients. Perfect recipe! Thank you, I really enjoy it. I made this dish for a dinner party and it came out absolutely delicious! Everyone loved it! It had a balance of flavors and the lamb was tender. Definitely keeping this on my recipe list. Amazing recipe. Limited the amount Cayenne pepper to about the minimum, and it is was enough for the kids to feel and enjoy the chilli-ness. Only one change. The effectiveness of a marinade is often improved by adding something acidic (e.g. yoghurt, lemon…). I added a good splash (about 1/4 of a cup) of cider vinegar to the marinade. Great result for a bit more tanguiness and sweetness. I’m so glad you enjoyed the Biryani, and thanks for the tips about the marinade – I’ll give it a try with cider vinegar next time! making it soon. I am also so glad that I came across your site. I really enjoy foods from around the world. I tried this recipe recently and, frankly, I was disappointed. Not because of the individual recipes and instructions for the lamb curry and the basmati rice were less than excellent, but because they each for my tastes tasted better separately than combined. Separately both the curry and the rice were fabulous. The curry had a deep, complex flavor and a long finish, something that I always look for in a curry. And the rice was aromatic like a good basmati rice should be with all the grains fluffy and separate, plus the added complexity of the spices. But together I thought that the whole was less than the sum of its parts. Layering and baking the two ingredients seemed to dry them out, particularly the rice, (perhaps I baked them too long, although I don’t remember baking them for more than 35 minutes). But the flavors, which were rich and distinctive separately, seemed to become less vibrant and more subdued. And I thought that the combined dish looked dull when compared with the separate bright red of the curry and the contrast between the curry and the white of the rice. Oh well, I’m looking forward to making the recipe again but this time I’ll have the curry and the rice separately. I would be curious if anyone who has tried it also preferred the ingredients separately. And I also thought that the texture of the cucumber raita was too thick, at least when compared with the raitas that I have in Indian restaurants. But perhaps, since the flavor was very good, it’s just that I prefer what I am used to rather than what’s more authentic. I tried thinning it with some milk but it was still too thick for my taste. But, like I said, that’s just a personal preference. Thanks very much for the recipe. I can’t wait to serve the individual components to an Indian friend of mine and see what she thinks. Ed, I so appreciate the time and thoughtfulness you put into this review. I’m sorry you were disappointed in the dish as a whole but I’m happy you enjoyed the individual components. I’m thrilled that you’re going to make it again and share it with your Indian friend. I hope you stick with the recipe and find your own favorite way to enjoy it. And I hope you’ll keep me posted if you try any other Panning The Globe recipes. I’m glad to hear that! I hope you’ll cook it and enjoy!! Hi do I put tomato sauce or tomato paste. Took my 11 year old nephew to the local spice shop to get all the spices and to the market for all the groceries. The lamb is marinating in the fridge marinating. He is psyched out of his mind to cook and eat this tomorrow!! Thanks much!! How fun to shop for spices and ingredients with your nephew and then cook together. Is he a budding chef? I hope you all enjoyed a scrumptious dinner! This is one of my favorite Indian dishes – your recipe looks fantastic! I have had this and it is probably my favorite recipe. I made this biryani for my family this evening. It came out absolutely delicious. This is easily my favorite biryani recipe yet. Even the raita came out great. My family says “restaurant quality, dad…restaurant quality”. Thanks for putting this recipe together. It is a winner for sure. Thanks for your comment Dave! I’m so glad you and your family enjoyed the Biryani. It’s one of our family favorites! My son Paul requests it all the time. Deb and I had this last night. Incredible!!!!!!!!!!!! This is absolutely stunning! My husband and I love lamb – definitely going to try this recipe…love all of those spices. Some fun artsy photos. I like them. I also like the recipe. I live about 2 hrs away from an Indian restaurant. I am in craving mode big time. Good thing I am spending the weekend in Seattle in about 10 days AND my friends were groovin’ with having Indian food too. Your post just whets my appetite. ohhhhh i love Lamb Biryani. It’s the rice. And the sauce. And maybe the lamb. I don’t know if I will attempt to make this at home but I love reading the recipe to appreciate what goes into make such a beautiful dish. This looks amazing. Deb and I are big Indian food fans. I have my Sunday night meal now. Can’t wait. Eddie and I love Indian food, too. Happy eating to you and Deb!